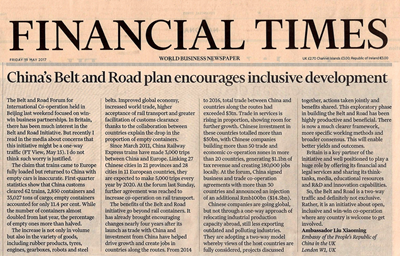 The Financial Times Publishes A Signed Article by Ambassador Liu Xiaoming Entitled "China's Belt and Road plan encourages inclusive development"
The Belt and Road Forum for International Co-operation held in Beijing last weekend focused on win-win business partnerships. In Britain, there has been much interest in the Belt and Road Initiative. But recently I read in the media about concerns that this initiative might be a one-way traffic. I do not think such worry is justified. The claim that trains came to Europe fully loaded but returned to China with empty cars is inaccurate. First-quarter statistics show that China customs cleared 62 trains, 2,850 containers and 35,027 tons of cargo; empty containers accounted for only 11.4 per cent. While the number of containers almost doubled from last year, the percentage of empty ones more than halved. The increase is not only in volume but also in the variety of goods, including rubber products, tyres, engines, gearboxes, robots and steel belts. Improved global economy, increased world trade, higher acceptance of rail transport and greater facilitation of customs clearance thanks to the collaboration between countries explain the drop in the proportion of empty containers. Since March 2011, China Railway Express trains have made 3,000 trips between China and Europe. Linking 27 Chinese cities in 21 provinces and 28 cities in 11 European countries, they are expected to make 5,000 trips every year by 2020. At the forum last Sunday, further agreement was reached to increase co-operation on railway transport. The benefits of the Belt and Road initiative go beyond rail containers. It has already brought encouraging changes nearly four years after its launch as trade with China and investment from China have helped drive growth and create jobs in countries along the routes. From 2014 to 2016, the total trade between China and countries along the routes had exceeded $3tn. Trade in services is rising in proportion, showing room for further growth. Chinese investment in these countries totalled more than $50bn, with Chinese companies building more than 50 trade and economic co-operation zones in more than 20 countries, generating $1.1bn of tax revenue and creating 180,000 jobs locally. At the forum, China signed business and trade co-operation agreements with more than 30 countries and announced an injection of an additional RMB 100bn ($14.5bn). Chinese companies are going global, but not through a one-way approach of relocating industrial production capacity abroad, still less exporting outdated and polluting industries. They are adopting a two-way model whereby views of the host countries are fully considered, projects discussed together, actions taken jointly and benefits shared. This exploratory phase in building the Belt and Road has been highly productive and beneficial. There is now a much clearer framework, more specific working methods and broader consensus. This will enable better yields and outcomes. Britain is a key partner of the initiative and well positioned to play a huge role by offering its financial and legal services and sharing its think tanks, media, educational resources and R&D and innovation capabilities. So, the Belt and Road is a two-way traffic and definitely not exclusive. Rather, it is an initiative about open, inclusive and win-win co-operation where any country is welcome to get involved.